CHITWAN, Feb 4: The number of tourists arriving at Chitwan National Park crossed 63,199 in the first six months Fiscal Year 2016/17. According to data from Chitwan National Park authorities, on average, more than 10,000 tourists entered the national park on each month of the fiscal year. The numbers show that the tourism sector is slowly returning to its old self. The tourism sector of the area was badly affected following the 2015 earthquakes and Indian blockade. Around 6,000 tourists visited the national park a month between mid-July and mid-September. According to Chitwan National Park, 6,031 tourists visited between mid-July and mid-August; 6,033 between mid-August and mid-September; 10,254 between mid-September and mid-October; 16,256 between mid-October and mid-November; 12,460 between mid-November and mid-December; and 12,165 between mid-December and mid-January. Narendra Aryal, assistant conservation officer at the national park, says 41,017 visitors were foreign tourists and 16,873 were Nepali tourists. Only 349 tourists from the SAARC region visited during the period. The number of tourists started to decrease after mid-November. The most numbers of foreign tourists arrived between mid-October and mid-November. Compared to last fiscal year, the number of arrivals has doubled. In the six months of last fiscal year, around 32,317 tourists visited the national park. Before the earthquake, around 107,952 tourists had arrived between mid July-August and mid-December-January of Fiscal Year 2014/2015. The number of arrivals did not reach even 100,000 the last fiscal year. If everything goes right, then the number of tourists might reach 110,000 to 120,000, park officials estimate. Before the earthquake, around 178,000 people used to travel to the national park each year. 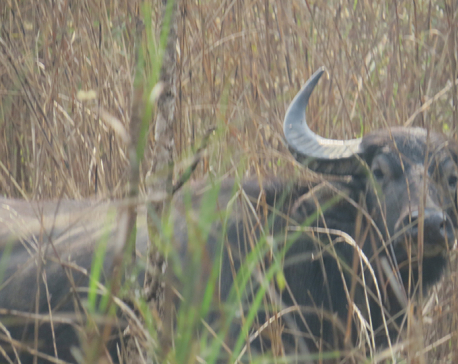 Chitwan National park is the third busiest tourist destination in Nepal after Kathmandu and Pokhara. Tourists travel to Chitwan National Park to watch one-horned rhinoceros, tigers and other wild animals.